Owners will confess that our loyal, faithful canine friends deserve many of the luxuries we humans enjoy and many are getting much more including accessories made in anything from diamond encrusted velvet to exotic reptilian skins and more. However this small, very modest, extremely durable collection of Dog Leads and Dog Collars from Tim Hardy is aimed at the practical owner who combines best quality with reliability and longevity for their dogs’ equipment. 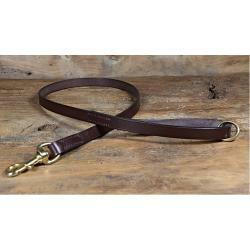 Handmade and hand stitched in best Sedgwick English Bridle leather and using solid brass buckles and fittings they are made in my workshop to the same proven standards of our renowned bridle leather belts and accessories. 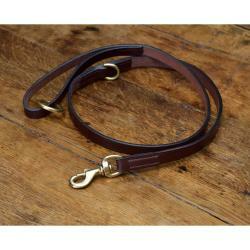 The first commission I received for bespoke Dog collars arrived thirty years ago in the form of a well proportioned lady visiting my workshop at the Jinney Ring Craft Centre in her large Volvo Estate car entirely dedicated to its two occupants in the well proportioned form of English Mastiffs weighing in at around 15 stones each and with a neck size requiring collars of 34” circumference and as such bigger than many of my belt customers’ waists. Whilst feeling diminutive in such company. 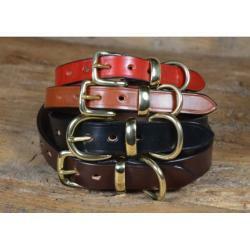 I duly accepted the order and as a result have made many more of numerous sizes, colours and widths over the years. 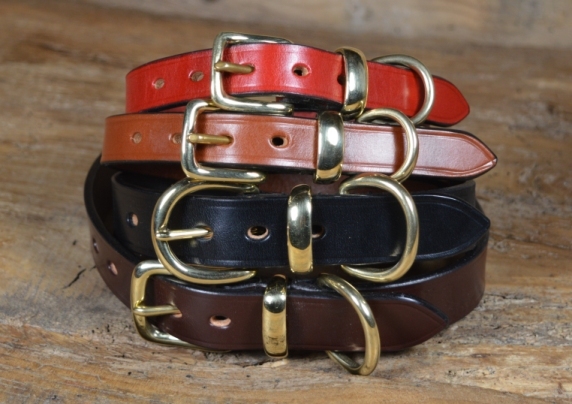 The same collars are now available here, made to order in all of the bridle leather colours, in widths of 3/4” / 18mm , 1” / 25mm or 1 ¼” / 32mm (other widths by special request), sized to your dogs specific neck size and with solid brass or nickel plated solid brass buckle and fittings. Sizing can sometimes cause difficulties but please see the guidelines and options or contact me by telephone or email.